An upper and a lower residence, with tropical garden views from every window. Each with living room, bathroom and separate entrances. They can be adjoined as one residence. Furnished with phones, cable TV, high speed internet, wi-fi. A covered outdoor lanai has a third bathroom. For families, small retreat groups, multiple families and couples. Sleeps 2-10 people with connected upper and lower residences with separate entrances. Guests have full access to the 5 acres of the Gardenland Estate. For information on how you can visit the gardens and stay as a guest at Garden House, contact Robert Henrikson. Email: roberthe@sonic.net. Garden House Upper Residence sleeps 6 people. Two bedrooms with a third bedroom on enclosed sun porch. Full bathroom. Roomy island kitchen. Spacious open living room with many windows and views. Dining area on an enclosed sun porch to enjoy the surrounding beauty. Garden House Lower Residence sleeps 4 people. Two bedrooms, bathroom, wet bar and living room. Sliding glass doors open to the gardens and fruit orchard. Nightly rental rates: Entire Garden House $450/night plus HI tax. Upper Residence only $270/night plus HI tax. Lower Residence only $180/night plus Hi tax. Two night minimum for reservations. For more details and reservations, contact Robert Henrikson (808) 264 8184. email: roberthe@sonic.net. 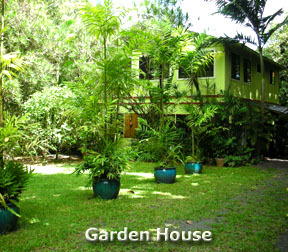 Hana Gardenland Garden House is an approved County of Maui Short Term Rental Home. Permit Numbers: SUP2 2013/0010 and STHA 2014/0001.